My vegetable garden is made up of six triangles in the shape of a mandala with an olive tree in the middle and a seat around. My sanctuary, my space where I find quiet, my contentment and peace. When I work on my garden, I usually start from one triangle and work my way around until all are rotated, weeded, mulched and planted to my satisfaction. By the time I finish with triangle six, it is time to start at the beginning again and around I go. A cycle or circle of meditation. There are bees, butterflies, snails, big juicy green caterpillars, foxes, woodpeckers, parrots, and a mole that drives me incessantly crazy. But my favourite of all, is my friend, the kingfisher. In the triangular closest to us, there is a knobbly stick which I especially put in for my friend, the elegant, but grand kingfisher to sit on. And he does sit there, but always flies off before I can get really close to appreciate him and his long beak and aqua, blue wings. When we moved to Portugal almost a year ago in the height of Summer from Israel and released two bewildered cats and a very dishevelled elderly dog into their new home, a new country and into the beauty of this lush, green cool climate with the potential of lots of overcast and raining days, it was a dream come true for me. After many very hectic days, one of the first things I did was find a potential spot for my vegetable garden. A spot of peace, calm, quiet and completeness. A spot to be inspired and for the JOY it will bring. The spot I found was this one. It was a much narrower space to work with than my garden in Israel but I knew I wanted to create the same idea with a central point and in some form or shape of a mandala. What I chose is this rectangular space. Protected from the winds which blow strong off the Atlantic in the Summer months. 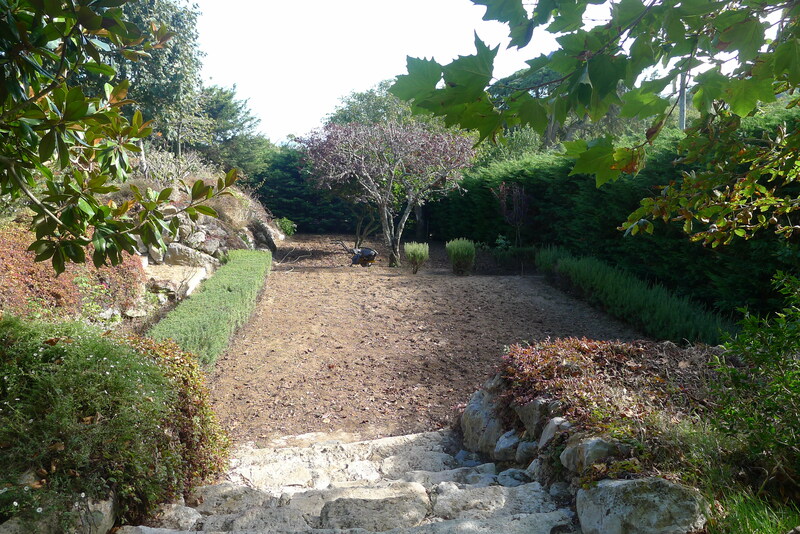 A blank canvas with a gardenia and plum tree at the very end, which could extend in the future when I needed more space – I envisioned beds of potatoes and sweet potatoes way down there. So as we prepared the soil, I sat on those stairs and started sketching and planning. While it took shape, I planted in pots outside the kitchen, zucchinis, tomatoes and different fresh herbs, and even a spaghetti squash which took off in an abundance of leaves. It bared no flower or fruit, but with much leafy enthusiasm threatened to enter into our kitchen. So as Summer ended and Winter passed, the spaghetti squash, tomatoes and zucchini in the pots died off and Spring began. And with another summer just beginning – a vegetable garden takes shape. This space does have a feeling of being hidden. You need to walk down into it and when I work, I feel enclosed, protected – a secret space where I can disappear into and not be seen or found for hours. On either side, it has a long shrub of rosemary bushes and a row of the sweetest smelling roses. I have thrown in seeds of flowers and sunflowers and by the mid-Summer, it will be a surprise to see what survives and thrives. In the early and quiet of the morning, I come to check on everyone’s growth. I enjoy the buzz of watching green shoots poke through the soil and I wait for the inspiration as to what to make and add to everyone’s lunches when I go back to the quiet of the kitchen. Maybe a flower or two to surprise them when they sit to open and eat some hours later at school or work. Right now, as I write, my little vegetable garden is home to four varieties of courgettes, two varieties of beans, the climbing yard bean you see in the distance and a French green bean, three varieties of tomatoes, radishes gone to flower, chard, spinach and small kale plants which I save from the snails each morning. Purple and red cabbage, the last of the broccoli, rhubarb, eggplant, endless varieties of lettuce, arugula gone wild, sweet peas, capsicum, cucumber seeds just now pushing their way through the soil, more herbs and plenty of flowers. What an inspiration Stacey! Beautiful! I come to this page when my heart needs a good, deep sigh. And I think to myself that soon I will have such a splendid garden to lose myself in. And when I do, I will undoubtedly think of what you have shared with all of us. Thank you.